Department of Sociology, University of Oxford, UK. Social networks are back in fashion. Emergence studies have shown that many intriguing properties of complex systems lie in their patterns of interaction. And since those patterns of interaction can be represented as networks, they have suddenly caught the attention of a new community of scientists: new not only because they come from very different backgrounds but because they also feel they have jointly envisaged a brand new field to discover (Watts 1999, Barabási, 2002; Buchanan 2002, Strogatz 2003, Watts 2003). The truth, though, is that the new science of networks is not that new at all: sociologists have been studying them systematically for more than five decades (Moreno 1934). Social network analysis has focused its attention in the way network structures relate to social structures and on how the positions different individuals occupy in them affect their chances and decisions. There are still two genuine reasons to echo the enthusiasm that accompanies the rediscovery of networks. One is the interdisciplinary nature of the new community and the other is the introduction of dynamics, both in and on the network. What now matters is not only how networks look at a moment in time, but also (and particularly) how they evolve. This involves specifying how the actions and attributes of agents unfold given the topological properties of the network and vice versa: a paradigm example of structuration ripe for simulation. It turns out then that this enthusiasm will not lead to the founding of a new science but nonetheless to the much needed broadening of an important research area. The papers collected in Dynamic Social Network Modelling and Analysis provide positive proof of what can be achieved within this broader field. The papers were presented in the context of a workshop organised in November 2002 by the US National Research Council to enhance understanding of (and suggest strategies of defence against) terrorist activity. The objective of the book is therefore twofold: to summarise, on the one hand, what the community is able to offer; and to present, on the other, some operational ideas intended to help policy-makers in their real-world decisions. But the book says as much about the former as it says little about the latter. The reason is that its chapters present work still very much in progress and unable to offer any conclusion other than that more research needs to be done. The papers are also very different in their scope and techniques. Even allowing for the fact that the "Workshop Summary" which opens the book makes a (valuable) effort to find shared concerns that might serve as a skeleton for the book, what is really missing is the flesh: a theory able to give coherence and unity to all the findings presented. Without that, the book offers an asymmetrical compilation of research pieces that very occasionally connect with another. This is rather ironic in a book on networks. Here is a summary of the resulting mosaic of proposals. 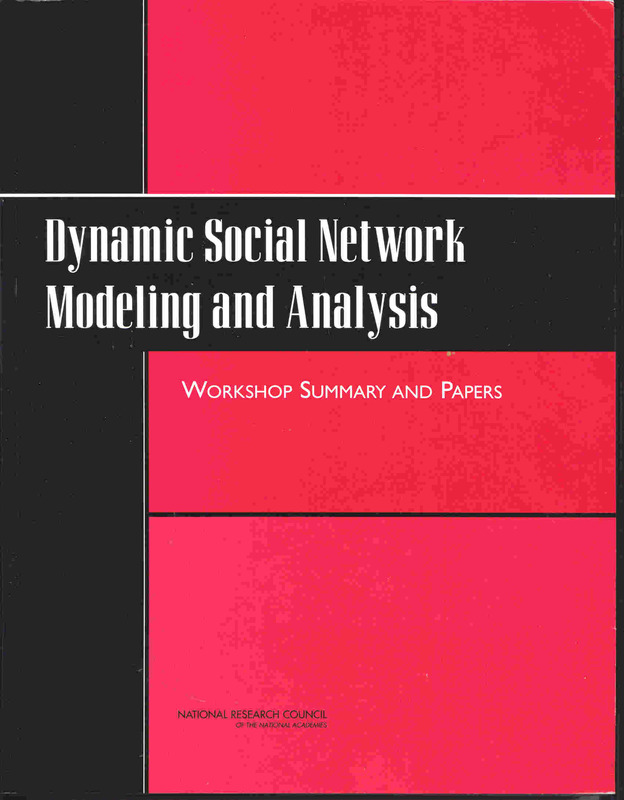 The papers are grouped into four categories: Social Network Theory Perspectives, Dynamic Social Networks, Metrics and Models and Networked Worlds. The Social Network Theory Perspectives section includes four papers intended to show that people and groups do not act in an autonomous fashion but rather in an interdependent way and to demonstrate that consequently a structural analysis (focused on connections) is the best strategy for analysis. Linton C. Freeman investigates how social groups emerge using ethnographic and field data. Harrison C. White, melding three different approaches, analyses the importance of autonomy and equivalence in markets modelled as networks. Noah E. Friedkin uses network data from a field study of a policy group to analyse interpersonal influence in networks and test the potentialities of social influence theory. Finally, David Lazer explores how information and innovation diffuse in public networks, paying special attention to possible solutions for free-riding and sub-optimality problems. The papers compiled in the Dynamic Social Networks section address the evolution, emergence and dynamics of network structure. The paper by Johnson, Palinkas and Boster focuses on how informal social roles affect the evolution and stability of social networks. Carley suggests an approach to Dynamic Network Analysis based upon the combined use of multi-agent modelling, machine learning and a meta-matrix approach to network representation. (A meta-matrix is a multiplex representation of entities and connections that enriches the traditional one-dimensional representation.) Snijders builds a statistical model to show that no inference about the processes responsible for network genesis and dynamics can be made from the observed degree of a network. Macy, Kitts, Flache and Benard analyse self-organised polarisation by exploring the dynamics of influence and attraction between computational agents. Morris, using an HIV transmission network as an example, introduces Exponential Random Graphs Models (ERGM) in an attempt to decompose overall network structural properties into the effects of local rules of interaction. Finally, Stanley and Havlin attempt to develop specific strategies which will destroy threat networks and defend threatened networks against attack. The Metrics and Models section comprises five papers, all of them presenting methodological developments in the construction of statistical models and metrics for understanding social network data. Wasserman and Steinley make some initial steps towards a robustness and resistance theory for social networks. This involves looking at how descriptive network statistics (such as connectivity, centrality or bridge counts) can be used in a substantive context. Seary and Richards introduce spectral methods to describe a variety of network properties (such as degree of robustness) and to understand the relationship of these properties to node or link attributes in large, complex, multivariate networks. Handcock presents recent advances in the statistical modelling of random graphs and develops a Markov Chain Monte Carlo algorithm for general random graph models. Borgatti proposes new ways of approaching the Key Player Problem: given a network, find a set of nodes that, if removed, maximally disrupts communication among remaining nodes. Bienenstock and Bonacich analyse the sense in which efficiency may be compromised in networks with a high degree of centralisation. Finally, Palmer, Gibbons, and Faloutsos present a new data mining tool which proves to be faster and more accurate in the study of large graphs. The final Networked Worlds section includes five more papers with a general concern: understanding the structure and processes in large-scale networks. Jensen and Neville review some of the methods for constructing statistical models of network data. Hoff proposes the use of random effect models to capture network dependence. Butts develops a strategy to measure distances in a total network structure using data on smaller interpersonal networks. Contractor and Monge apply the multi-theoretical multi-level (MTML) model to study the creation, maintenance and dissolution of adversarial communication and knowledge networks. Finally, Ward, Hoff and Lofdahl use a latent space approach (probabilistic models of links among actors based on latent positions in an unobserved social space) to understand networks structures in an applied international relations context. As a whole, the book has three things to offer: (i) an up-to-date state of the art description of what is being done in social network research, which is of indubitable importance for anyone involved in social simulation; (ii) some promising research lines intended to address the challenges that accompany large scale dynamic network data (such as imperfect information and uncertainty) and (iii) a conjoint claim that if social network analysis is to offer something relevant to public agencies, more support is needed in the form of funds for research and academic co-operation. As Kathleen M. Carley argues in the summary that closes the book, using dynamic network models to do anything other than satisfy the intellectual goals of science will require us to take the issue of realism seriously. And this brings us, once again, to the role of the (missing) theory. If we cannot systematise conditions under which our models prove true, that is, under what theoretical constraints they make sense; and if we cannot, therefore, measure the distance between those constraints and reality, then we can (i) say nothing to policy makers; or (ii) will say things that mislead. As far as the book is concerned, (i) seems to be the option taken which, given the alternative, is probably for the best! MORENO J. L. 1934. Who Shall Survive? Foundations of Sociometry, Group Psychotherapy and Sociodrama. Nervous and Mental Disease Publishing Company, Washington, DC. STROGATZ S. H. 2003. SYNC: The Emerging Science of Spontaneous Order. Theia, New York, NY. WATTS D. J. 2003. Six Degrees: The Science of a Connected Age. Heinemann, London.